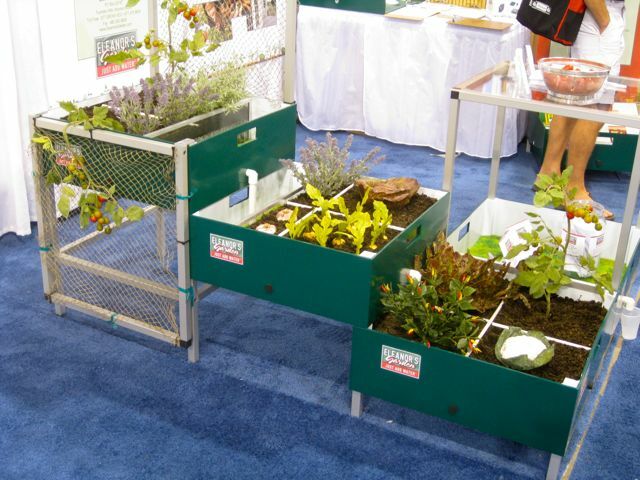 "Portable raised garden beds for the urban square foot gardener." I don't think I've ever written such a long blog title, but it works! It's exciting to be able to present some space efficient options for those of you who are short on yard space but big on dreams of growing your own food. One of the most important characteristics of all the raised container gardens presented here is that they are all portable! When you live in an apartment or townhouse it's helpful to have portable gardens so that you can use your patio or balcony more efficiently. If you are entertaining and need more space for furniture, roll your gardens out of the way! Let's take a look at some gardening options for apartment and small space gardeners. Don't let the beautiful willow basket fool you! Soil will not bleed through the wicker slots because there is a "grow bag" inside the basket. The planting bags come in three sizes for different plants: Herb Planting Bag, Salad Planting Bag, Vegetable Planting Bag & Potato Planting Bag. You guessed it, the potato planting bag is the deepest. I recommend that these allotment planting bags be set on top of a 1 or 2" inch layer of pea gravel to lift the bottom of the baskets away from standing water. A less expensive alternative to this stylish system is to grow your vegetable directly in an open bag of soil or even a potato chip bag! Yes, you can even grow tomatoes with their deep root systems this way. The roots will spread laterally. These sturdy stacking containers can be stacked up to 10-tiers high. That's a lot of planting space and the system is self watering for extra appeal. Excess water from the top levels drain to lower levels where the water is caught in a removable tray. I appreciate the rolling casters on these stacking planters so the garden can be moved around. Vertical gardening is a smart approach when lateral space is at a minimum. What sets Eleanor's Garden apart from the other two is this container garden comes with the soil and seeds! The "gardener," (and I use the term loosely), just has to water the instant vegetable garden. Eleanor's Garden is a complete, compact and portable garden kitchen that is delivered to your door. 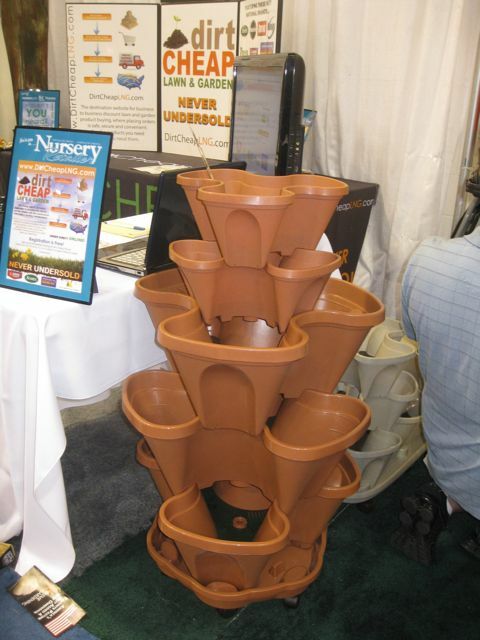 Anyone can assemble the garden bed in less than an hour and the proprietary drainage system lets you garden in a variety of locations. If you are into modern or contemporary design, the clean lines of Eleanor's Garden may appeal to you. 1 drainage field mat Made from non-woven 100% recycled plastic, the lightweight mat creates even, thorough drainage and allows oxygen to reach the vegetable roots.No need for rocks! Eleanor's Garden is available for purchase at independent garden centers across the USA. This is a system that I like because of the planter design itself. The square foot grid appeals to me! Everyone should thank Mel Bartholomew, author of the "Square Foot Garden Book." 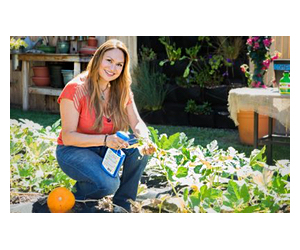 Mel invented the "square foot gardening" system that allows one to plant in square foot grids to maximize crop yield. Now the whole world is "square foot gardening!" For those of you who like to recyle or repurpose materials, take a look at my "Recyled Wood Tree Box as Raised Vegetable Planter" post on my Foodie Gardener blog! Landscape tree boxes can be found for free, (or cheap) at landscape projects. Visit the Garden Center TV website and community to preview new garden products from around the world and share your opinion about them! Cats can be a challenge to deter from an inviting “poop box” which is actually your garden! You can box in your raised garden containers with chicken wire. Just make sure it is tall enough to let your plants grow. 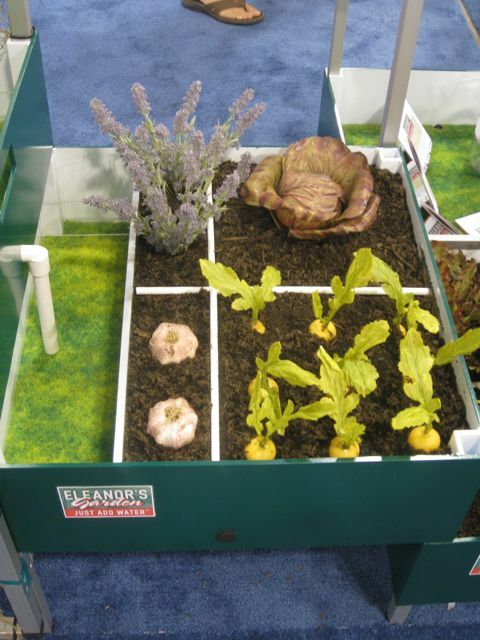 Hi, I love the Eleanor’s Garden system and am seriously considering it for my first attempt at growing a vegetable garden. My concern is how I would prevent the neighborhood cats (that often come into my yard) from attacking my garden. Do you have any suggestions? Hi. I like raised beds in general for growing edibles since it is the least labor intensive way to get a garden going. You can create tall raised beds for those who have trouble bending over or kneeling. You can create built in seating by capping the tops. Easy control of soil conditions. Just add compost, no spading. Got to love it. Good luck with your Pea Patch project! I a chef in the Seattle area. I am excited about being part of a peapatch project. Are raised beds better for a community based project? Thanks for your comment Marian. I agree Eleanor’s garden is useful and simple to use! I really liked Eleanor’s garden. The all in one concept makes it easy for a beginner. Cheers for the information. I found it very helpful and look forward to seeing your posts in the future. Terrific website. These are some great ideas. I will have to give them a try. Nice landscaping website ALexander. Good information for your clients and future ones. If you are looking for a wicker of natural material basket, I line with heavy duty plastic or trash bags. I keep the plants for the arrangement in their plastic pots and arrange them within the basket using floral foam or packing peanuts to raise them higher or lower in the basket. I hope I explained clearly. In reference to the top item (garden baskets) I just noticed the company is in UK, which is unfortunate cuz I’m in the US. I’m looking to create my own garden baskets that will be suitable to place on a balcony or on a city fire escape. My question is, what material would you line the insides with, so it can be a suitable garden basket, with proper drainage. We live in a small apartment in California and I will definitely try the self watering stacking planter. Our main window is facing the main road and I think it would make a stunning visual. Thanks for dropping in . Love the way the Home Allotment Planting Bags by Burgon & Ball in photo #1 were placed in baskets. I’m picturing a late September setting in New England featuring such container gardens. The planted baskets could be intermingled with baskets holding pumpkins, gourds and Indian corn — a festive harvest scene. its been awhile, i want to send you some of my Telescopic vertictal gardrens. i need our address please. i wanna do that video that we discussed about creative gardns.i have saved y chimnea to do that for you. as we discussed in 2009, i got increadably busy with my apartment houses . now that the new year is here in ready to tackle my garden product. im hopping to meet you soon in the 2010 garden season.